Inspired by the original Splash collection, the Marc Jacobs Splash Cucumber Eau de Toilette is a crisp, fresh scent that dives into the essence of summer. Bursting green top notes of watery Cucumber, Cactus Flower and Lotus Leaf give way to a floral heart of Tiger Lily, Freesia and Linden Blossom, before settling on an aromatic, woody base of Musk and Blond Woods. A light, breezy and clean fragrance housed in an elegant, glass cube bottle. 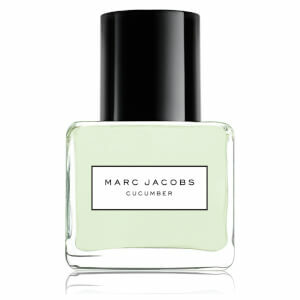 Developed by Perfumer Vera Venore, the fragrance has a subtle green tint of Cucumber to evoke a grassy summer garden. Top Notes: Watery Cucumber, Lotus Leaf, Bamboo, Cactus Flower. Heart Notes: Lily of the Valley, Linden Blossom, Freesia, Blue Tiger Lily. Base Notes: Frosted Musk, Blond Woods.